Not everyone wants to make a dramatic statement with their garden, for some of clients somewhere to sit, a lawn and some attractive borders are all that’s required. This garden belongs to a new build home in Papworth near Cambridge, it’s owners just wanted a simple family garden where they could indulge in kick abouts on the lawn. Somewhere that would be very straight forward to care for. When I first visited the garden in was mainly sloping bare earth with a small badly paved path along the back of the house. 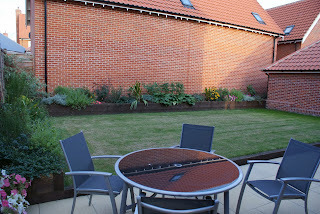 The design I came up with involved little more than some low cost terracing with retaining walls made from softwood sleepers and a plain but good quality patio of Marshalls’ Saxon paving. 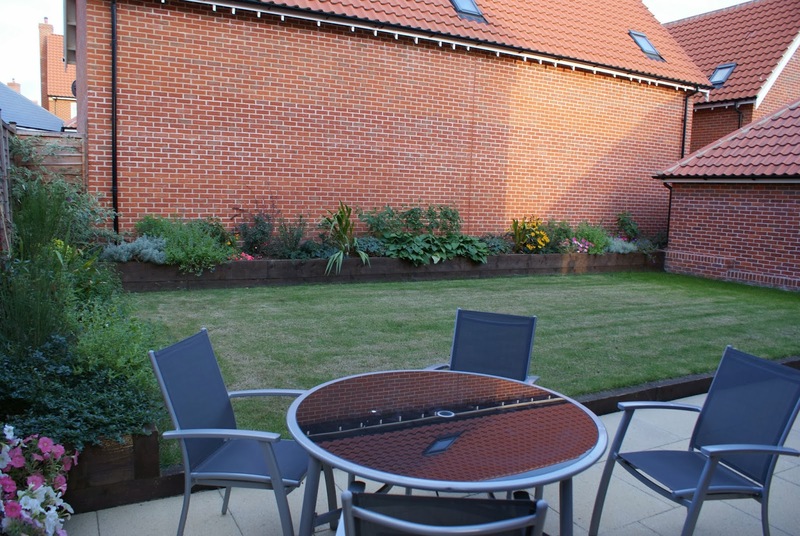 A small raised bed was included at the point where the house and garage met to break up an unsightly corner and change of level. The planting design is practical and intended to fill the beds and soften the boundaries.